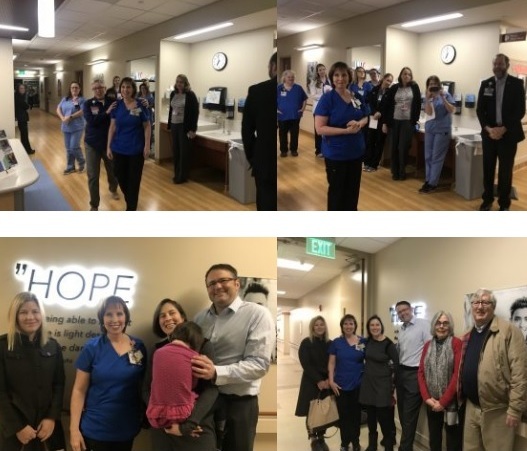 Lindsey Hayes Daly, Executive Director of the Hayes Family Foundation and mom of Clare, one of our NICU grads who was featured on the Wall of Hope, made an unexpected visit to NICU nurse Diane Holten. During the visit, Lindsey informed Diane that the Hayes Family Foundation made a gift to the Saint Joseph Hospital Foundation and established the Diane Holten Scholarship Fund for NICU Education. The fund will support nursing and caregiver education to help supply resources for the NICU team to continue to be able to provide the highest level of care for NICU patients and their families. Lindsey described how during their two-week stay in the NICU, all the nurses empowered her and her husband Trevor as parents to feel confident in taking care of Clare once they got home. Clare is now an energetic and healthy six-year-old. At the presentation, Lindsey called Diane her “super angel nurse” and said she knows they aren’t the only family that has been blessed by the help of all the amazing NICU nurses and caregivers at Saint Joseph Hospital. Congratulations on this well-deserved recognition, Diane and the entire NICU team. Megan Harrison, a long-time friend of Lindsey Daly, whose son was in the NICU with Clare and who is a nurse at St. Joe’s joined Lindsey and Trevor Daly and Penny and Richard Hayes to present the Diane Holten Scholarship Fund for NICU Education.